Base camp at Ski Apache. All photos by Darlene Fiske. Skiing in New Mexico? 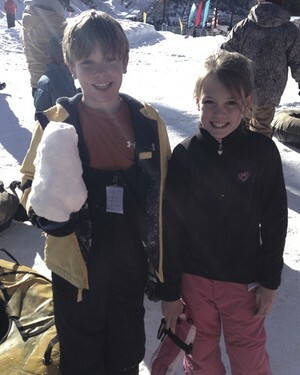 It's better than you might think, as Austin-based ski-phobe Darlene Fiske discovers on a family trip. 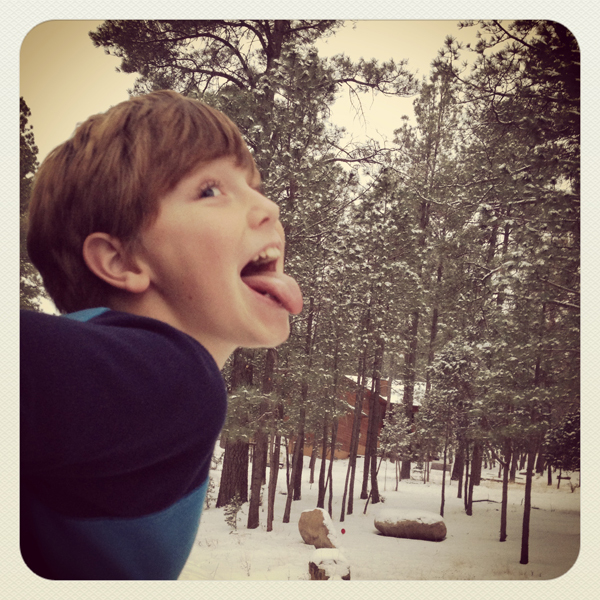 RUIDOSO, New Mexico – I hate skiing. Okay, "hate" might be strong, but the thought of hurling my body down a mountain at blood-curdling speeds and dodging reckless snowboarders in subarctic temperatures is not my idea of a good time. And let's not talk about how I look like the Pillsbury Dough Girl in puffy everything. But I do it. I do it for the love of my nine-year-old son, who proclaimed after our first two runs on in Ruidoso, New Mexico, "If skiing is a winter sport, then my new favorite sport is skiing." Lucky for him, his big blue eyes are my weak spot, so we spent the next three hours going down the same two green runs on the slope, over and over and over. As the kid whizzed past me in his golden jacket, I remembered the nickname we gave him last year: The Yellow Bullet. I really should make him wear a helmet. 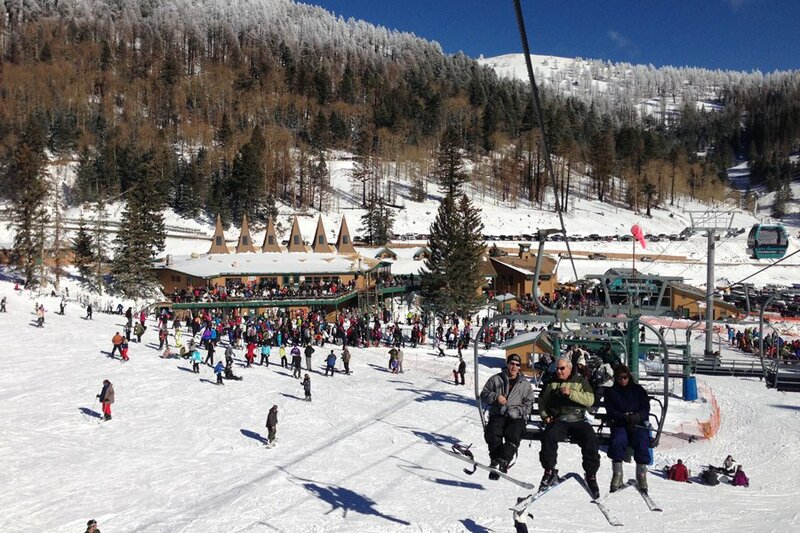 New Mexico is an unlikely state for a ski trip. And Ruidoso isn't fancy. If Ruidoso were a shoe, it would be a Hush Puppy. No frills, but reliable and gets the job done. I would wear a Hush Puppy if I had to; it's just not my shoe of choice. But Ruidoso is a decent driving distance from San Antonio, where my sister lives with her two young kids, and an easy flight for us, so it's the shoe that fits best for now. And that's just fine. This year, it snowed during our four-day visit (making it our second year in a row of good snow fortune), and Ski Apache opened more lifts and runs throughout our winter escapade. Ruidoso is a three-hour drive from Albuquerque, a nine-hour drive from San Antonio, and two and a half hours from El Paso International airport, where we flew direct from Austin on Southwest Airlines. The drive from El Paso is so scenic that my son listed "the road trip" in his thank-you note to Grandpa as one of his favorite parts of the vacation. 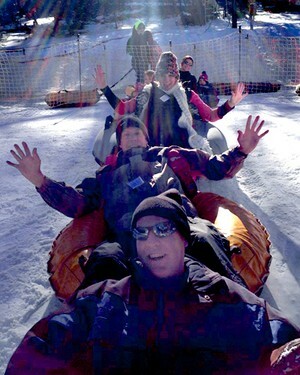 is nearby, and the town has a lively main street with plenty of shopping and restaurants and nearby hills for sledding. At the edge of town is the 12-mile county road leading up to Ski Apache. My dad invited me, my brother, and sister and our respective families on the trip, and each couple took turns cooking a big meal while dad kicked back and enjoyed being taken care of. This year, the kids entertained themselves making snow blobs and chasing the dog around the house. But as soon as we ventured out of the house, we were all in awe of the white powdery sensation falling from the sky. Snow is a rare sight in South Texas, and we basked in the snowflake glory for every possible moment. 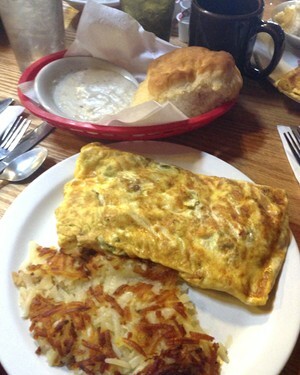 Three days of skiing, one day of snow tubing, fresh snowfall, hot chocolate, and an epic breakfast (just look at the hash browns in this photo...) were just a few of the highlights from the four-day, kid-friendly vacation. Here were the highs and lows. The house we found through slept up to 12 people and was the hub of conversations, great meals, and après ski activity (read: Baileys and coffee). The kids had their own private room with pull-out beds and a TV and VCR to watch movies. My son proclaimed his breakfast burrito to be "legendary." I proclaim it was gone is less than 120 seconds. My happy place. In fact, everyone in our group loved this day. From my 3-year-old nephew to my young-at-heart dad (who asks that I not reveal his age), we all screamed as we hit chilling speeds via our tube train. The conveyer belts take you to the top of six different runs, making this an activity the whole family can do for several hours without tiring. They also have a few small amusement park rides that the younger kids enjoyed afterwards. As a bonus, I got to wear my super cute Tory Burch boots, one of the few cold-weather fashion items I own. My 7-year-old niece loved the all-day school. During the last hour, she was so good that we all skied green trails together until the place closed. Our official pitstop after skiing and tubing for hot chocolate and firewood. Dear owner of said Shell station, please make sure that at 5 p.m. your hot chocolate machine does not break down. It is a highlight of coming off the mountain. Don't let it happen again. The new gondolas at Ski Apache opened after we'd left. So technically we didn't get to love it, but I know we're going to love it when we go back. Such a welcome treat and such a nice way to get a sense of the town. The kids loved the by All Lathered Up that I bought them. Who doesn't love monkey farts? The Yellow Bullet off the slopes, catching snowflakes the way they're meant to be caught. Against the grey backdrop of the lift chair, quite possibly the most beautiful thing I've ever seen. Stratego, Monopoly, chess. If this makes me a nerdy mom, then I don't want to be cool. Who wear sweaters and love a toasty fire. Specifically, my sister-in-law's dog, Daisy. That little white furball wore a different sweater every day. 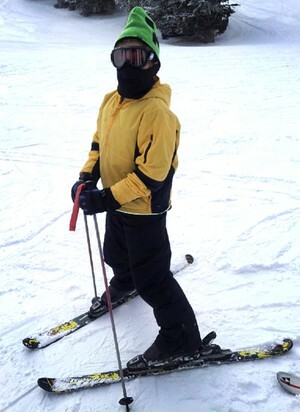 I saw some great parkas and accessories coming down the mountain. Unfortunately, I wasn't wearing them. (I mean, I was admiring a dog's winter fashion.) This is an area I need to improve before next ski season. 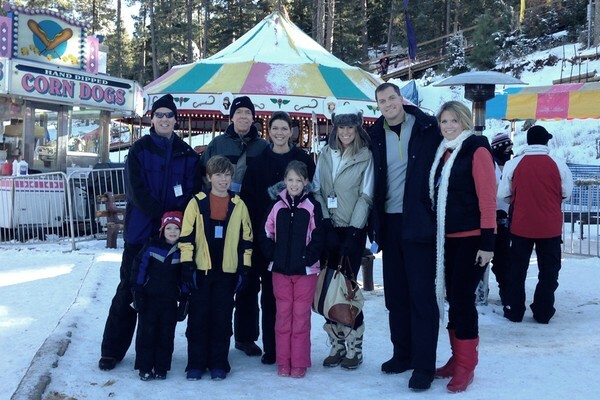 The clan at Ruidoso Winter Park. I watched my brother almost get smushed by my sister's SUV when he tried to push it up the hill in the snow. Without going into gory details, please do not stand behind a large SUV while it is sitting on ice. While you're at it, make sure your car is an all-wheel drive or put on chains on the tires BEFORE you attempt to drive up a snow- and ice-covered hill. My husband and I rented a Chevy Equinox, which we nicknamed The Superhero Car because it got us through every treacherous road condition effortlessly. Ski Apache is at the end of a windy, 12-mile road leading from the outskirts of Ruidoso to the mountain. It is part of , which provides free shuttle for their guests to and from. For some reason, I always drive every year, every trip up and down. And because I'm never a passenger, I have to delay my boozy après ski until I get back to our home. Rough life. No game of Monopoly should last five hours. Especially if you are on the losing end. Fly: El Paso International Airport (ELB) is a two-and-a-half hour drive from Ruidoso; Albuquerque Internationsl Sunport (ABQ) is three hours. When to go: Ski season runs from Thanksgiving until the end of March.